Can I use SKX Open/Advance in my project? Serial Port Baud Rate: 1200, 2400, 4800, 9600 or 19200 bps. SKX Open: up to 10 bytes. SKX Advance: up to 29 bytes. SKX Open: 48 objects of 1 bit. SKX Advance: 65 objects (40 of 1 bit, 20 of 1 byte, y 5 of 14 bytes). Modular sum complemented (2’s complement). Acknowledgement frames (ACK): they are only allowed with the SKX Advance (5 bytes). It must be taken into account that this device has been designed for the control of audio and video devices, not as a communication interface. Can I use ZN1RX-SKXOPEN with a protocol different from RS232, for example, RS485? What are the differences between SKX Open and SKX Advance? How can I know which application program I need for my project? SKX Open and SKX Advance are two different application programs that share the same hardware device whose reference is ZN1RX-SKXOPEN. The choice of the application program depends on the features of the RS232 protocol and the communication objects you need on the KNX side. What type of connector is delivered along with ZN1RX-SKXOPEN? ZN1RX-SKXOPEN is delivered along with a female DB9connector (originally DE-9). Does ZN1RX-SKXOPEN require an external power supply? ZN1RX-SKXOPEN does not require an external power supply, it only needs the KNX bus power to work; however, the RS232 bus must be powered independently of the KNX bus. The required power is usually obtained from the terminal equipment connected to the serial bus, but sometimes an external power supply is needed. How must be interpreted the light signals of the programming LED? Fixed red: ZN1RX-SKXOPEN in programming mode. Flashing red: ZN1RX-SKXOPEN in safe mode. Green: it indicates the existence of communication through RS232 port. Can I use ASCII characters when configuring SKX Open/Advance? No, SKX Open/Advance must be configured only with hexadecimal characters (0-9 AD). How can I translate the ASCII characters into hexadecimal encoding? On the Internet, it is possible to find plenty of links with tables showing the correspondence between ASCII characters and its hexadecimal encoding. How can I configure frames longer than 10 bytes (20 hexadecimal characters) in the SKX Advance? To configure frames longer than 10 bytes in the SKX Advance, they must be used the extensions available in the “FRAME CONFIGURATION” tab. These subframes are added to the 10 byte main frame automatically at the time of transmission. By using these subframes, it’s possible to configure frames of up to 29 bytes. For more information on using these subframes, see the section 2.2.2.Special frames in the device manual. Do you have any sample project that can be used as reference to configure my ZN1RX-SKXOPEN? Yes, in the SUPPORT section of the website of Zennio, within the area of Project Examples, Gateways section, there are available some very well documented projects that can be used as a guide for setting the ZN1RX-SKXOPEN devices. My ZN1RX-SKXOPEN does not communicate with the device, what can I do? Adjust the communication settings properly: velocity (baud), parity, time between frames to be sent, reception complete mode and time out. These parameters must match the specifications of the RS232 protocol of the device controlled. 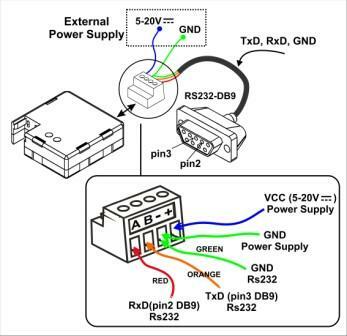 Check the RS232 port connection, the correspondence between pins, and if there is power at the terminals + and -. Adjust the Time out parameter properly to ensure the correct reception of the frames. See the section 2.1 Communication configuration in the manual of the SKX Advance. SKX Open: section 3.3.Error Code Communication Object of the manual. SKX Advance: Section 2.4. Error Objects of the manual. If you have a RS232 port on your computer or an adapter, with the appropriate software that can be easily found on the Internet, you can monitor the RS232 communication to make sure that the ZN1RX-SKXOPEN is sending the appropriate frames, as well as the format of frames transmitted by the device to be integrated. If the issue is not solved following the above indications, contact our Online Technical Support.